a blog about life, spirituality and evidence of abundance in everyday life. 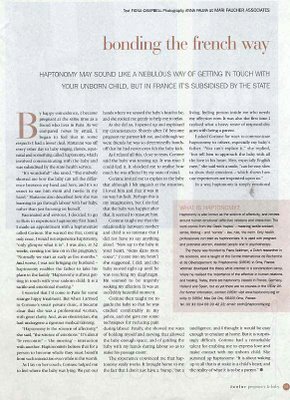 First written for Junior Pregnancy and Baby Magazine, this is a description of an extraordinary French pregnancy treatment called haptonomy that helps parents communicate with their unborn children. I know that sounds a little unlikely, but don't dismiss it out of hand. In France it is a well established, mainstream pregnancy treatment. It is pretty significant: If we really can communicate with babies in the womb, then that changes the way we view pregnancy. The clipping is a little hard to read, so I've transcribed it below. 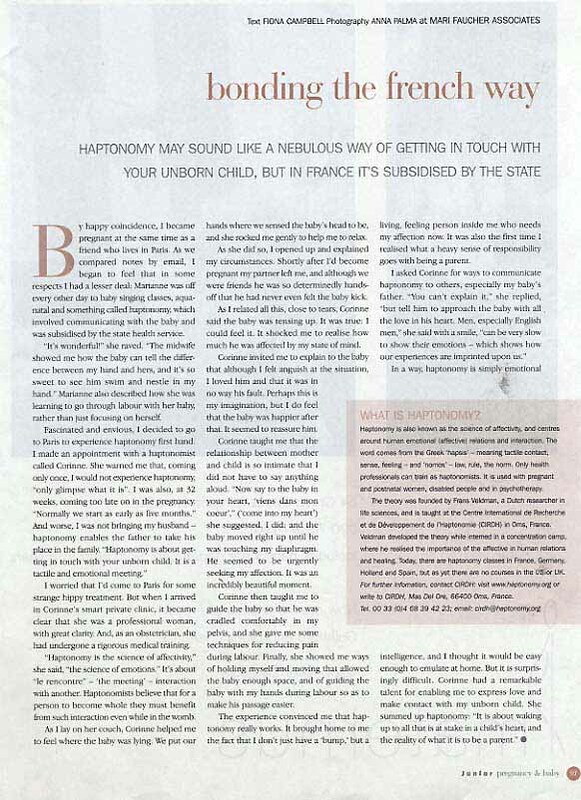 Haptonomy may sound like a nebulous way of getting in touch with your unborn child, but in France it's subsidised by the state. By happy coincidence, I became pregnant at the same time as a friend who lives in Paris. As we compared notes by email, I began to feel that in some respects I had a lesser deal. Marianne was off every other day to baby singing classes, aqua-natal and something called haptonomy, which was involved communicating with the baby and was subsidised by the state health service. 'It's wonderful!' she raved, 'The midwife showed me how the baby can tell the difference between my hand and hers, and its so sweet to see him swim and nestle in my hand.' Marianne also described how she was learning to go through labour with her baby, rather than just focusing on herself. I worried that I'd come to Paris for some strange hippy treatment. I worried that I'd come to Paris for some strange hippy treatment. But when I arrived in Corinne's smart private clinic, it became clear that she was a professional woman with great clarity. And, as an obstetrician, she had undergone a rigorous medical training. 'Haptonomy is the science of affectivity,' she said, 'the science of emotions.' It's about 'le rencontre' - 'the meeting' - an interaction with another. Haptonomists believe that for a person to become whole they must benefit from such interaction even while in the womb. As I lay on her couch, Corinne helped me to feel where the baby was lying. We put our hands where we sensed the baby's head to be, and she rocked me gently to help me to relax. As she did so, I opened up and explained my circumstances. Shortly after I'd become pregnant my partner left, and although we were friends he was so determinedly hands off that he had never even felt the baby kick. As I related all this, close to tears, Corinne said the baby was tensing up. It was true: I could feel it. It shocked me to realise how much he was affect by my state of mind. Corinne invited me to explain to the baby that although I felt anguish at the situation, I loved him and that it was in no way his fault. Perhaps this is my imagination, but I do feel that the baby was happier after that. It seemed to reassure him. Corinne taught me that the relationship between mother and child is so intimate that I did not have to say anything aloud. 'Now say tp the baby in your heart, "viens dans mon coeur, mon cheri" ("come into my heart") she suggested. I did: and the baby moved right up until he was touching my diaphragm. He seemed to be urgently seeking my affection. It was an incredibly beautiful moment. "the baby moved right up until he was touching my diaphragm. He seemed to be urgently seeking my affection. It was an incredibly beautiful moment." Corinne then taught me to guide the baby so that he was cradled comfortably in my pelvis, and she gave me some techniques for reducing pain during labour. Finally, she showed me ways of holding myself and moving that allowed the baby enough space, and of guiding the baby with my hands during labour so as to make his passage easier. The experience convinced me that haptonomy really works. It brought home to me the fact that I don't just have a "bump" but a living, feeling person inside me who needs my affection now. It was the first time I realised what a heavy sense of responsibility goes with being a parent. I asked Corinne for ways to communicate haptonomy to others, especially my baby's father. "You can't explain it," she replied, "but tell him to approach the baby with all the love in his heart. Men, especially English men," she said with a smile, "can be very slow to show their emotions - which shows how our experiences are imprinted upon us. "Men, especially English men," she said with a smile, "can be very slow to show their emotions - which shows how our experiences are imprinted upon us." In a way, haptonomy is simple emotional intelligence, and I thought it would be easy enough to emulate at home. But it is surprisingly difficult. Corinne had a remarkable talent for enabling me to express love and make contact with my unborn child. She summed up haptonomy: "It is about waking up to all that is at stake in a child's heart, and the reality of what it is to be a parent." Haptonomy is also known as the science of affectivity, and centres around human emotional (affective) relations and interaction. The word come from the Greek 'hapsis' - meaning tactile contact, sense, feeling - and 'nomos' - law, rule, the norm. Only health professionals can train as haptonomists. It is used with pregnant and postnatal women, disabled people and in psychotherapy. I have just read your wonderful piece on Haptonomy. My wife and I live in Ibiza although she is from Paris and we would love to get in touch with Corinne, whom you mention in your blog. Or any other recommended centre in Paris. Thank you for your enlightening article on Haptonomy. My husband and I just moved from Paris to London and are interested in finding a Haptonomy practitioner here in London. By any chance have you come across any midwives that are practicing here in the city? Thank you again and please let us know your thoughts. Thank you for your enlightening article on Haptonomy. My wife and I just moved from Paris to London and are interested in finding a Haptonomy practitioner here in London. By any chance have you come across any midwives that are practicing here in the city? Thank you for your message. There isn't anyone practising haptonomy in this country that I'm aware of. HOwever, many midwives do believe that you can communicate with a foetus, and you can certainly find very good NHS midwives who will be sympthetic to the ideas of haptonomy. I am actually writing a piece for the Royal College of Midwives Magazine for their conference, so hopefully that will stimulate some interest. Alternatively, you could try the British hospital in Paris who offer haptonomy and see if they know of anyone in Britain that offers it. All else failing, the main thing is to talk to your baby 'with all the love in your heart' (as Corinne said to me) as a couple. You could try telling the baby what position you need it in for the birth, what day you want it to be born, or anything positive. Many thanks for your feedback. Considering many options and as my parents live in Lyon and I think I am going to give birth in Lyon and take haptonomy's class there. Thank you for your post. I would encourage you to give birth in the place where you are going to feel happiest and ideally the place where you are going to bring up your children. Giving birth for the first time can seem very daunting, but remember that it will in all likelihood go smoothly and there is great comfort in being at home with your nearest and dearest. Haptonomy is a wonderful thing, but I"m not sure it's worth moving country for, although you do say in your email that there are several other reasons as well so perhaps it is right. I do think it's important to remember that you are not just having a child, you are beginning a family. I have noticed that when one is pregnant one can get a little sucked into the placing too much emphasis on the birth, and particularly on having a natural birth etc, when what happens afterwards is of so much more importance. I read your article and found it very interesting, specially for those who never heard about the theme. I live in Brazil, where this subject is completly unknown, very few people know the existence of such science. This weekend we learn a little about the technique with a woman who learned it in Netherlands. I`d like to translate your article to portuguese and insert it in my website, wich is directed to motherhood themes, if you give your permission for that. Thank you for your atention and for your writing! Great article and info. Thanks for sharing. "Only health professionals can train as haptonomists." All of us are capable empathy and deep connection with others. It does not require a health degree. In fact, a health degree hinders the ability to be empathic and empathetic. So many modalities converge to create many capabilities. Personally, I am quite leery of anyone who "develops" or discovers something and then claims to be the only one. My foundation is CranioSacral and a hybred of mine own with my teacher's hyrbred of a collective of modalities. My teacher's process is a hybred of CS, polarity therapy, sensory experiencing (trauma healing with Peter Levine) and craniosacral. I've add energy modalites as well .. but it all comes down to do one's own inner work and connecting with our self. Then we can connect with babies in utero or outside the womb. Thanks again for sharing this. It's very important work. I'd also like to say the process of communication with the baby begins before conception. We can communicate with the soul or consciousness before conception. WOmen know this. I can communicate with my son who is 6000 miles away because of our communication that began before conception. Thanks for your comment. It is extraordinary that so few people know about haptonomy, when it is such an amazing thing. I was very heartened that my best friend was able to take what I had written and understand it, and apply it during her labour without any training. So you are right that in a way anyone can practice haptonomy. But the actual haptonomy institute only accepts trained health practitioners. Moreover, I was unable to contact them at all. This could be that after the Diana accident the French became very afraid of the British media and very wary of talking to us. Sadly! I'm a feature writer, not a paparazzi!! ps yes of course I give permission to translate the article into Portuguese. Your post brought back some good memories! Haptonomy is a very powerful tool. I enjoyed it very much during my first pregnancy. Shame it doesn't exist in England!